What to do when Teamviewer suddenly doesn’t connect or you can’t or don’t want to use it for other reasons? What if a friend needs urgent assistance and you need to see his screen to help out? Standard Open Source tools to the rescue! 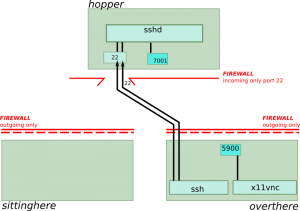 If you know how to use SSH from the command line and have access to an user account on a remote server running SSHD, then this article will save you! There are tons of (unfortunately for me) half-working instructions in the web about how the commands must look like. I took me several hours to wrap my mind around the problem. For this article, I’ve decided to make an image gallery so that you can see easier what is going on behind the scenes. Running just 4 commands will do the trick! We are sitting in front of the computer called “sittinghere”. We want to see the screen of the computer called “overthere”. There is a server called “hopper” which runs an ssh daemon (sshd) listening on the standard port 22. Our data will ‘hop’ though there, hence the name “hopper”. The initial situation: Regular firewalls are constrict “sittinghere” and “overthere”. 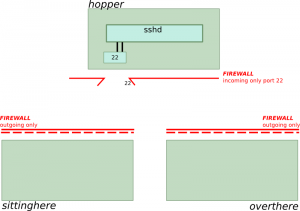 “hopper” has a firewall with only port 22 open. A VNC server is started “overthere”. It listens on port 5900. With this command, sshd on “hopper” is instructed to create a socket on port 7001. And when someone connects to this port, it will be as if the same connection had been made on “overthere” port 5900. In the code above, “localhost” refers to the computer “overthere” because the command is executed on this computer. An ssh client is started “overthere” with Remote Port Forwarding options. 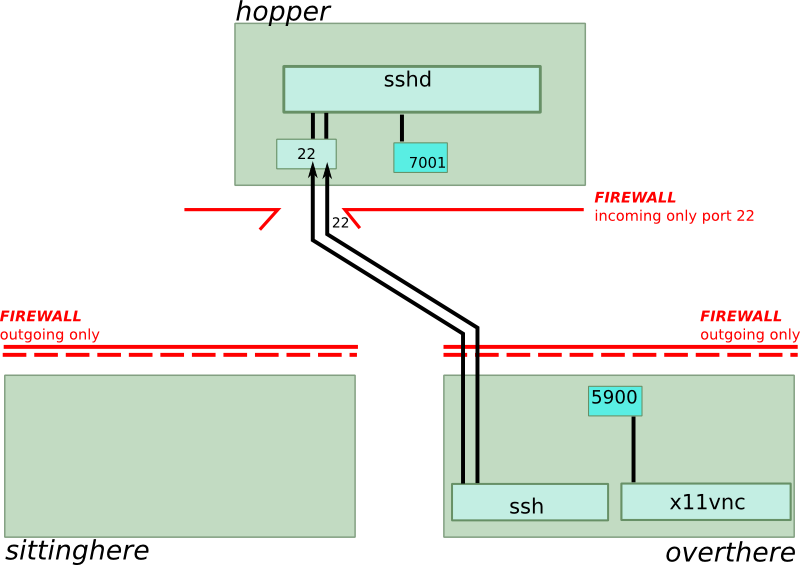 A connection is made to sshd, running on “hopper”. sshd opens a port on localhost:7001 and listens for incoming connections. “sittinghere” starts ssh with Local Port Forwarding options. It connects to sshd running on port 22 of “hopper”. It also creates port 7002 on localhost and listens for incoming connections. Now, remember that a connection to port 7001 on “hopper” will have the same effect as if the same connection had been made on “overthere”. This means we will have a kind of ripple-through effect: As soon as we connect to port 7002 on “sittinghere”, the connection will ripple through until it connects to port 5900 of “overthere”. And this endpoint is our VNC server. 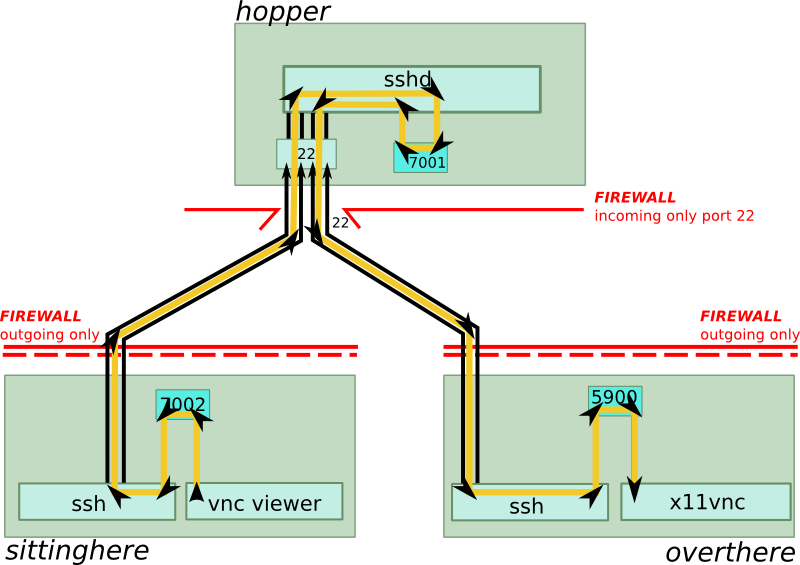 On “sittinghere”, a VNC viewer is started and told to connect to localhost port 7002. 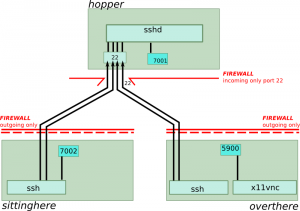 This connection is detected by ssh which makes sshd running on “hopper” connect to port 7001, which causes ssh running on “overthere” to connect to port 5900. Now the route is complete and we can see the remote screen! Congratulations, we’re now all connected through! If you have set a password (we’ve set it to “PASSWORD” in the above example), you now will see the remote screen. 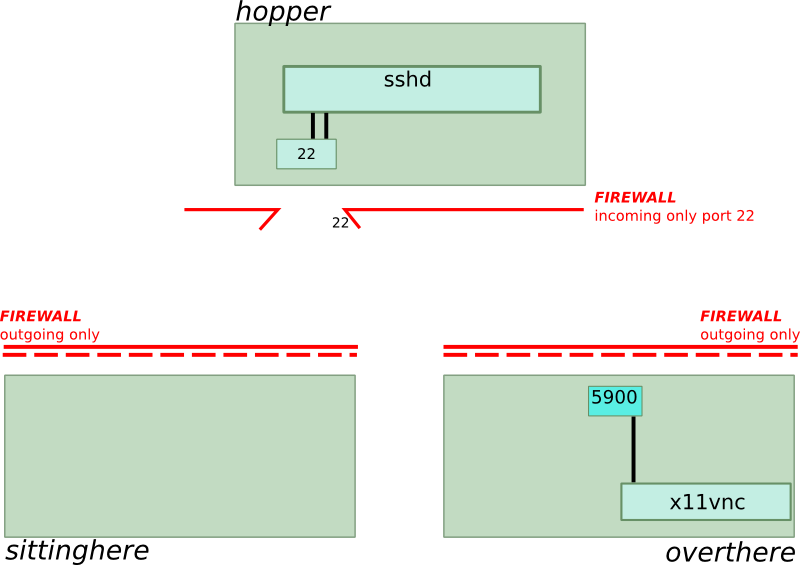 Note that we didn’t even have to execute a command on “hopper”, nor even reconfigure any firewall! My experience is that the quality and speed of the transmitted remote image is much better with this method than with commercial products. Of course, this is because commercial products have to divide and share bandwidth across all users. The SSH connections will stay alive until you terminate them. So, just type “exit” in the ssh terminals opened at “sittinghere” and “overthere” that we have been opened previously (to “hopper”). I’m glad I don’t have to rely on commercial products only any more! Life is suffering, contaminated by malevolence.